Released back in May, the track "Lifestyle" by Birdman, Rich Homie Quan and Young Thug took a while to catch fire, but when it did, it rocketed up the charts. Since debuting on Billboard's Hip-Hop/R&B chart seven weeks ago, the track has peaked at number seven and spent seven weeks on the chart. 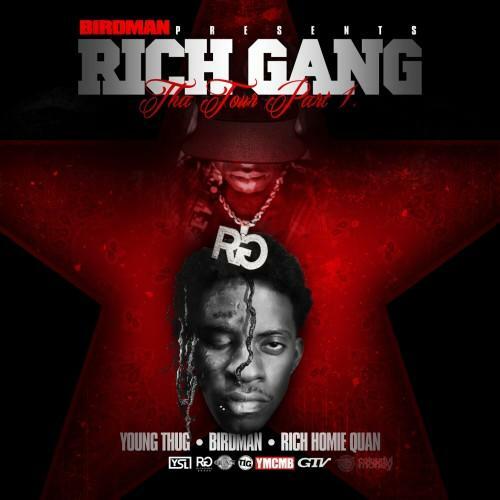 Now, the trio, who collectively go by Rich Gang, are releasing their first project: Tha Tour Part 1. Executive produced by all three, as well as London On Da Track (the beatsmith behind all three Rich Gang tracks we've heard thus far), the mixtape contains 16 standard tracks and four bonus cuts. Y'all dig this? Let us know in the comments.